For perspective, Microsoft recently broke down and allowed Microsoft Office on the iPad. For years that was one of its largest selling points for its Surface line of tablets. These are two fascinating sentences. First, we have Microsoft “breaking down” and “allowing” Office on the iPad. Now, certainly, the iPad is an extremely successful product, with–as The Motley Fool points out–a much more advanced app ecosystem. However, change that first sentence around a little: say, instead, that Microsoft recognized the value of producing Office for the iPad. Where The Motley Fool implies passive submission, we instead have a more aggressive, competitive action. Microsoft is thus taking the fight to Apple, making sure that iPad users remain in the Microsoft camp, using Office to edit Office documents natively (and selling a subscription to Office 365 to boot). It’s reasonable to assume, I think, that Office-using iPad owners will be easier to convert at some point to Surface and/or Windows 8.1 than iWork-using iPad owners (and the same can be said about Google Docs and the upcoming Office for Android). This isn’t capitulation on Microsoft’s part, it’s a continuation of their “embrace and extend” strategy. The benefit of maintaining Office as a de facto productivity standard also can’t be overstated. Second, we have the argument that Office was a selling point for Surface (“for years” is technically true but a bit of a stretch; nevertheless, I’ll allow it). The reality is that Office remains a selling point for Surface, particularly for the Surface Pro 3, about which the article was written. I’m talking about the complete Office 2013, of course, which no matter how good the iPad version of Office might be for a subset of tasks, it remains just that–a product that provides just a subset of Office’s capabilities. That might be fine for some people, but for many, including enterprise customers, having a taste of Office on the iPad is a gateway to the complete version, which you can only get on a “real” PC (or a Mac). I take issue with the rest of the Motley Fool’s argument as well. 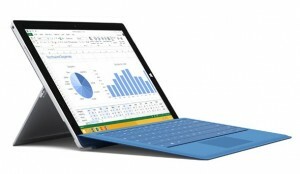 The Surface Pro 3 does compete with the iPad, arguably, along with the MacBook Air. But Microsoft says as much, by positioning it as replacing both. They’re not just telling people to buy the Surface Pro 3 instead of a MacBook Air. They’re telling people that they don’t need an iPad, either. I’m a testament to this strategy–I set aside my MacBook Air and my Nexus 10 tablet (as well as my iPad 3), which are collecting dust since I purchased my Surface Pro 3. The vaunted iPad and Android app ecosystems haven’t mattered, either, because outside of some casual games, there’s really very little that I don’t have in a Windows 8.1 modern app or–and here’s the kicker–in a far more feature-complete desktop version. The title of this post might be a little strong. I’m sure the Motley Fool doesn’t really, completely, misunderstand Microsoft’s strategy. It’s just that I doubt they’ve ever actually used a Surface Pro 3 to understand that it really is an excellent and potentially game changing product. If they had, then they’d understand that far from failing to see the iPad as the Surface Pro 3’s tablet competition, Microsoft is subliminally tossing the iPad under the bus. They’re basically saying (IMO, of course) that the iPad doesn’t matter, because it’s only an adjunct to the more important product–the full-on PC–and that, of course, the Surface Pro 3 renders the iPad irrelevant. Because, in truth, why carry (and pay for) a tablet to go with your PC when you can carry around both in a single machine (and a single investment)? Check out the following ad. Can one really argue that Microsoft is leaving the iPad out of the picture?